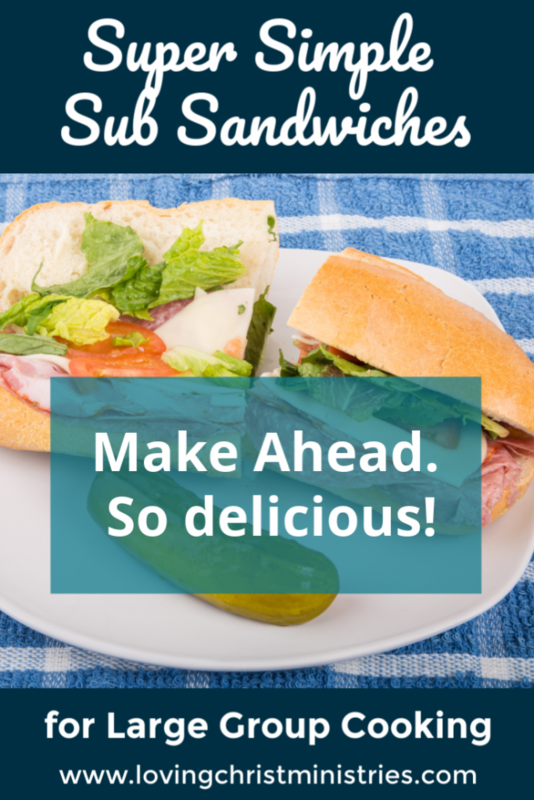 These super simple sub sandwiches are quick and easy to prepare for a large group. We offered these foil-wrapped hot and yummy subs for lunch at one of our recent retreats. They’re super simple to prepare ahead of time and provide a hearty and filling meal. Making enough for 60 can seem daunting, but with just a couple of helpers, putting these sandwiches together took no time at all. Blend. Swipe both sides of each loaf of bread with it. Sliced (lengthwise) loaves of Italian bread (we used one long loaf for every three sandwiches – the size depends on how many you have and how big you want each portion to be). On the sliced loaves of Italian bread, slather mayo. Add any and/or all of the ingredients you want. Slice to serving size sandwiches (3 to 4 per long Italian loaf), wrap in foil, bake at 350 for 20-30 minutes until cheese is bubbly and pepperoni oils soak into the bread. Serve hot. Since we made these all up ahead of time, Lainie, the lady who cooks for us (and wow, she’s wonderful!) just stuck them in a preheated oven while she set out the salad bar and desserts. By the time that was finished, the sandwiches were hot and ready to be devoured. Don’t forget your sides and desserts. We typically provide chips and a salad bar plus cookies, brownies, or cake for dessert.